I’m SO excited to take the time today to invite you to come SKYPE with ME! 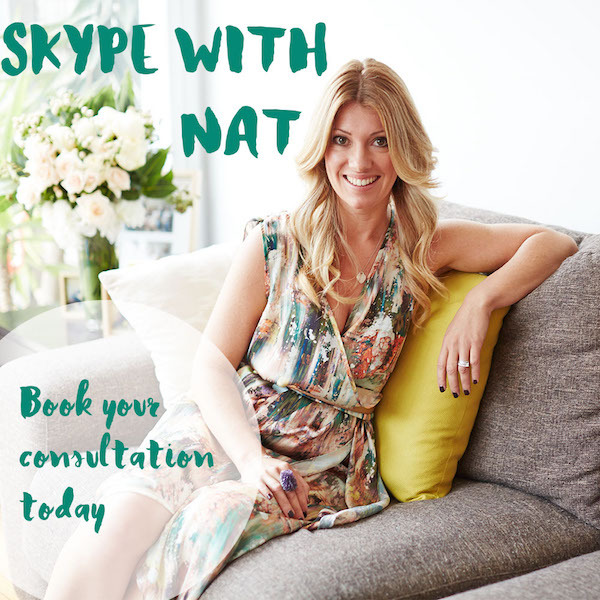 We’ve been offering skype consultations for some time but we are excited to take things to a new level with skype consultation packs to really help get your health on course. With so many of you spread far and wide, skyping in with me is a sure way of getting some one-on-one specific advise, just like a consultation in my clinic where we pour over your individual constitution (we are all so very different which is what I LOVE). Because let’s face it, handing out generic advice will do you some good, but the real sweet stuff, the icing on the cake, comes from getting personal. In a skype consult with me you can expect me to have spent great time looking over your health (via a form) prior to our meet. This ensures I can do away with the irrelevant stuff that you might have answered in your Q & A style consult form and really focus on the specifics that are going to make all the difference in your consultation. We will sit and chat about it over skype for 30 minutes after which I spend a further 30 minutes creating your treatment plan for you to implement over 6 weeks before your follow up consult. This formula works really well and we have been doing skype consultations this way for some time, the difference now is that we have a couple of skype packages to suit your specific needs. There is just one important factor with skype consultations (like any consultation really), and that is that YOU have to do the work. I’m here to help identify the cause of your health concerns and guide you to treating it at a deeper level. What you do outside of our consult is really what matters most. Implementing the treatment plan into your daily life is the only sure way to see results. Unfortunately I can’t do that for you! If you’d like to talk more about skype consultations, you can easily email my clinic The Pagoda Tree, reception@thepagodatree.com.au or call the clinic on (03) 96867454. We can talk you through the skype consult options to work out the best plan of attack. how much is a Skype consultation? Could you please explain to me the Skype consultation options including prices & wait time? Thanks so much, Natika ?